With festival season fast approaching and Coachella kicking off in a few weeks I thought it was about time to start my festival series on the blog. 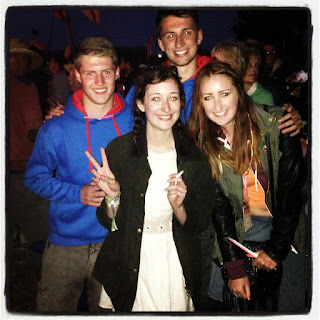 As some of you will know if you follow me on Instagram, I'm going to Glastonbury again this year and I'm honestly SO excited to be going back. I absolutely love it there and have so many amazing memories from previous years! I'm already starting my prep and even got a pair of wellies for Christmas, so I thought there was no better time to start this series than now! Today I'm going to share with you my ultimate festival essentials for anyone who's attending a festival for the first time! I've been to many festivals over the years so I feel like I'm qualified to be sharing my top essentials on my packing list! When packing for a festival there are so many things you have to remember that I've often thought I was all packed and ready to go and then realised I'd forgotten to pack my actual festival ticket or ID! 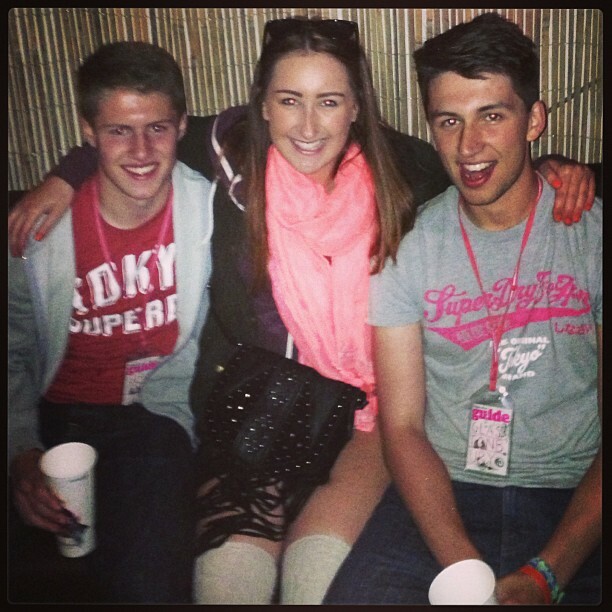 You will also need to make sure you have cash or your card with you so you can buy lots of booze (over 18s only!) If I take cash with me I always make sure I carry it around with me and never leave it in the tent because there are some awful people in this world who will go into tents and try and steal your things (luckily that's never happened to me). If you're like me and you love taking selfies at festivals then you can't forget to take your mobile phone. I ALWAYS take a couple of power banks with me too - they are life savers. At most festivals the signal isn't great so I never really tend to use it for contacting people but if you're in a big group, they you will probably need it to find out where to meet up when you've gone to watch different artists. There are usually facilities at festivals for you to charge your phones but the ques are always really long and the power banks do just the job! Top tip: put your phone on airplane mode while it's charging as it'll charge much quicker! Top tip: if you can find a tent with an extravagant pattern then buy it. There are SO many green and blue tents that it is SO hard to find your spot when you return after a boozy day of drinking! 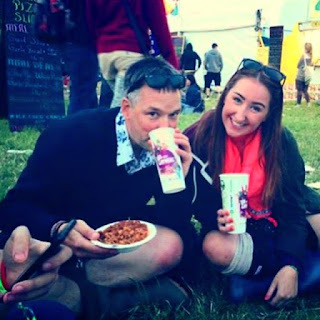 Even if you're one of those people that tends to purchase the festival food throughout the weekend, it's still a good idea to get a gas cooker and equipment for around your camp fire so you can make a cup of tea in the morning and have some quick snacks such as pot noodles! If you're camping in a large group then it's worth working out who should bring what so you don't end up with four different gas cookers! You'll need a camp chair for when you're sitting around the fire and getting ready for the day. You don't need anything fancy, just something that you can sit on to keep your dry from the soggy ground. Top tip: always put your chair zipped away in the tent when you go out for the day as some people do tend to wonder round the campsite and steal chairs! If you're anything like me and you can't really be bothered to que for the showers for 5 hours on a morning after a 20 minute walk from your campsite then the easiest alternative is a pack of baby wipes, a big bottle of water, some shower gel and a small towel. I often just put a swimsuit on and get Jay to pour some water over me by the tent and then voila you're good to go. At the end of the day you're only there for 3 days so shower before you travel and then freshen up little and often! At the end of the day, everyone is in the same boat as you! 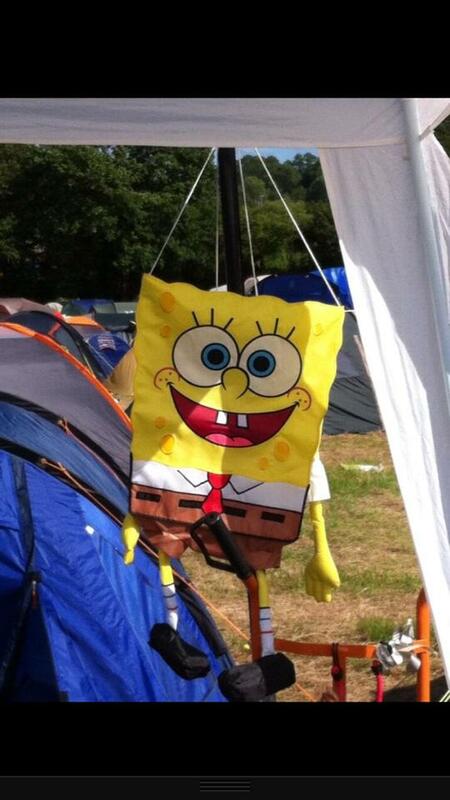 The final camping essential for Glastonbury is a flag. 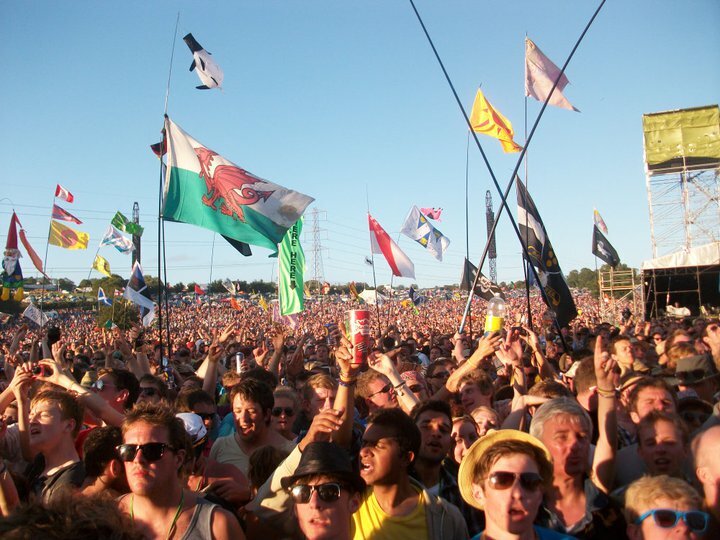 Like I mentioned before, finding your tent can be like finding a needle in a haystack so having a flag which you'll all remember can be a godsend. My dad often orders a customised flag so we stand out from the crowd! One of my biggest top tips when packing for a festival is to plan your outfits out before you go. I have been to many festivals and over packed and in all honesty, it's not worth it. The walk from the car park to your tent is waaaayyy longer than you think and carrying a really heavy backpack all the way is not fun! 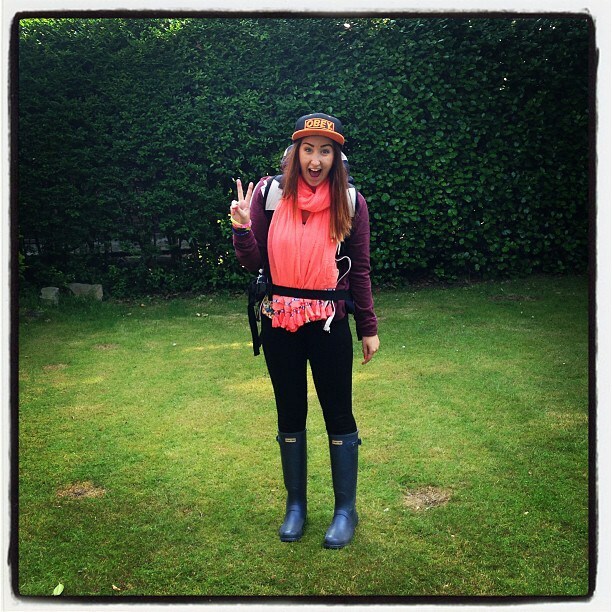 The first essential you need at a festival is your wellies/walking boots. 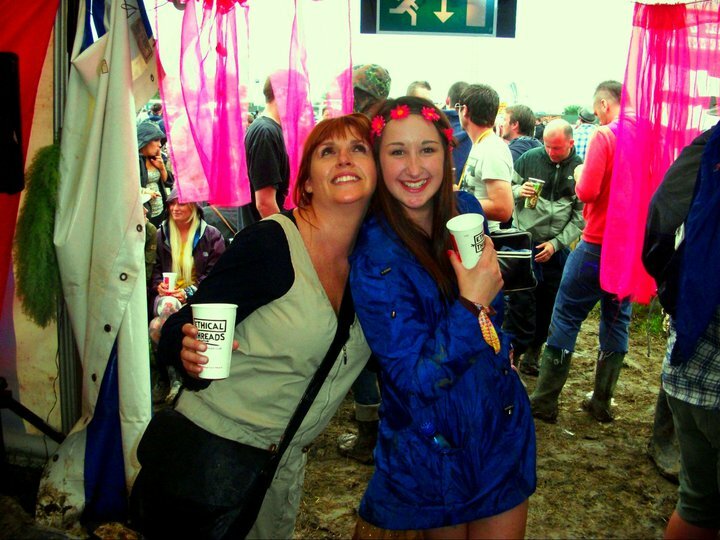 The weather at festivals can often be unpredictable but I always take wellies every year just in case there is lots of mud. A biker style boot can be a great alternative for the hotter weather. You'll also need to take lots of socks with you and I prefer knee high socks with wellies. If I have room in my bag I also like to take a pair of flip flops for wearing around the tents. You'll need to make sure you pack the normal stuff like underwear (always pack more of this just in case) and pyjamas, a waterproof coat and a jumper for layering when it gets cold in the evenings. For outfits, this will obviously differ with each person but I like to take a dress, a skirt or shorts and top combo and a playsuit option. You want to be comfy with the ability to layer up when the weather drops of an evening. Stay tuned for a festival outfits post coming soon! In terms of accessories, again this will differ depending on the outfits you're planning on wearing but I like to take some hair bands, a bum bag so I can keep everything safe, some sunglasses and jewellery! 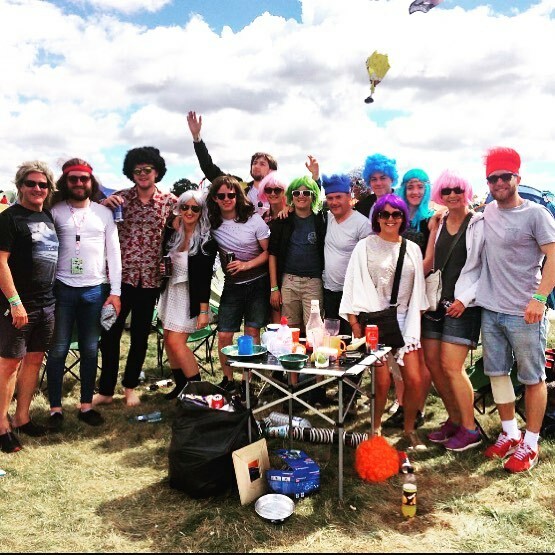 If you are going with a group of friends too you might decide to do a fancy dress day or wig day like we did at V fest a few years ago, so you may need to also remember to pack for that too! Like I mentioned before, a battery pack is essential for getting you through the festival weekend without running out of precious phone battery. Another great saviour is a torch for when your trying to desperately find your tent on the way back from the loos in the middle of the night! You can of course use your phone torch but you don't want to waste the battery so it's better to get a small torch that can do the trick. I always find it so difficult not to over pack when it comes to makeup and toiletries! I like to take multiple products so I have options because I like to switch it up. 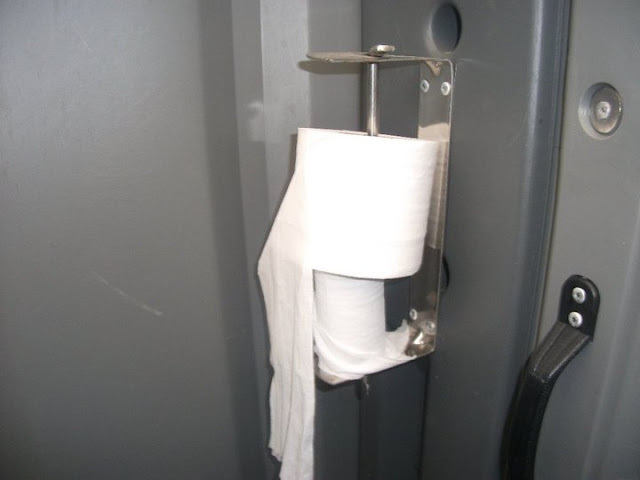 I obviously pack the essential toiletries; toilet roll (and lots of it because there is never any left in the loos! ), wet wipes, dry shampoo, toothbrush and toothpaste, deodorant, sun cream, hand sanitiser and moisturiser. I then pack makeup bits, so the obvious foundation, concealer, bronzer, highlighter, brow product, mascara, lip products and then I am a bit extra so I take lashes too! 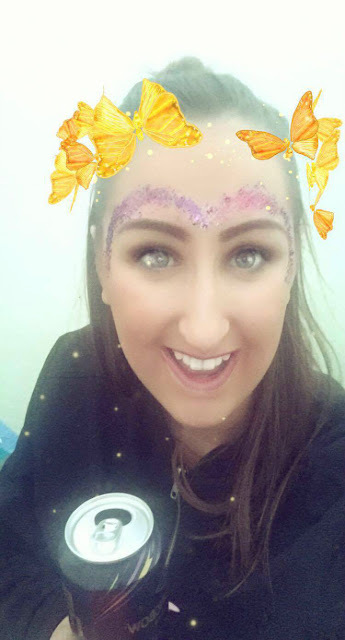 I also take lots of glitter, because let's face it, what's a festival without a bit of sparkle! Stay tuned for a full post on what I pack in my festival makeup bag and I'll also be sharing with you my top festival hair and makeup looks for festival season! You also mustn't forget a mirror and bobbles and a hair brush so you can tame your hair when it's looking a bit worse for wear!! Although most festival goers tend to enjoy the expensive festival food and drink, it's always a good idea to stock up on your own for around the tent. At some festivals they don't let you take alcohol into the arenas but luckily at Glastonbury it's all open so you can save some £££ by buying your own beforehand and taking it with you. Remember that most festivals don't allow glass so transfer any spirits or wine into plastic bottles or take cans instead. In terms of food, festivals are not going to be the healthiest of places, even if you try and cook the food yourselves. There is only so much you can do with a disposable BBQ or some hot water! We often take pot noodles or pasta n sauce pots for convenience and then pack lots of multi packs of crisps and biscuits. We also try and pack some fruit too for a bit of variation and goodness! Most of the time though we just eat at the food vendors as you'll spend the majority of the day out at the stages and exploring! So there's my top festival essentials for anyone heading to a festival this year (they'll even come in handy if you're just going on a camping trip). I hope this has helped you and that you have an amazing time during festival season. Keep an eye out for my upcoming posts in this festival series. I'll be sharing my favourite makeup and hair looks, my go to festival outfits and what I pack in my festival makeup bag. 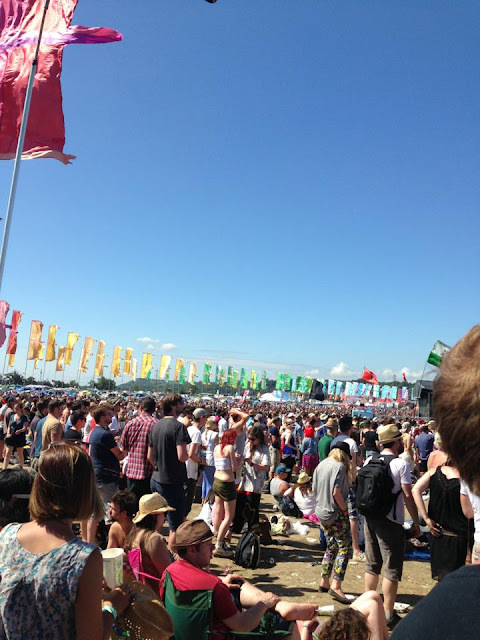 Great post - I have never been to a festival and these tips are quite insightful... Thanks for sharing!